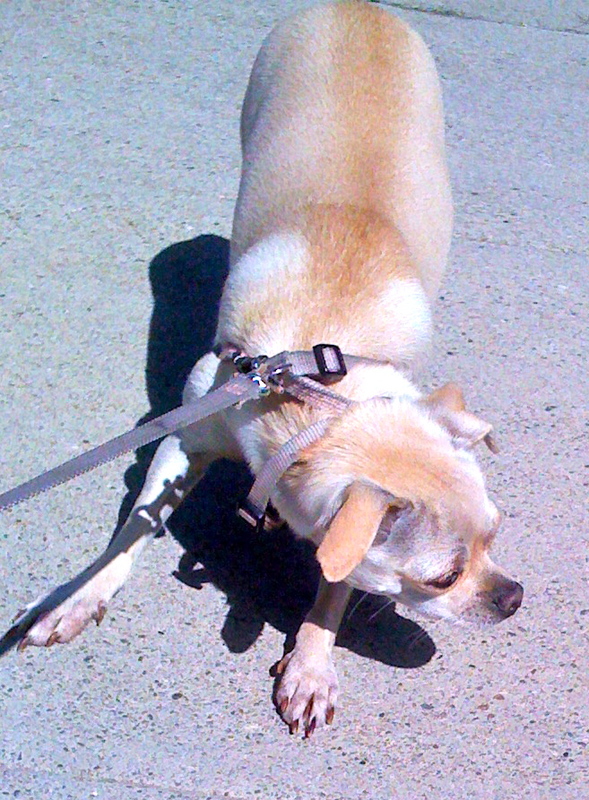 Stubborn Chihuahua Walking, or Not! I won't go. You can't make me! How do you get your little Chihuahua to walk nicely with you? In my case, you don’t. I’m in control most of the time and I know it. The trick is to not let your dog be in control. If your dog knows it can get away with being stubborn it will. With one daddy I usually win. He’s a pushover. The other daddy will not give in to my stubbornness so I relent and walk nicely. Sort of. At the beginning of each walk I get excited to go and explore. This lasts about one or two houses. Then I want to take my time and sniff everything. And if I find a treat, so much the better. But daddy wants to exercise. He wants me to move and I don’t. Unless, of course, I see another dog, a squirrel, a cat, a kid on a skateboard, a garbage truck or any other object of particular interest. At a certain point on my one to two mile hike I realize we’re going home, finally. So I take the lead and pull. Unless I find a really good smell or the wind blows a leaf my way. If I protest long enough my easy daddy gets frustrated and “air-lifts” me for a while. It’s certainly a quicker way to get where we’re going. Personally I don’t see the point in all these walks. True, I get to meet new friends and find treats. I catalog new smells and mark my territory. Occasionally I leave a gift which daddy insists on bringing home. These are all important jobs. But in the end we get home and I’m exhausted and need to take a nap. Maybe that’s what daddy had in mind all along. When/if your dog walks nicely give a little treat. Not too much, you don’t want to overfeed them. If your dog refuses to budge, try waiting them out. If they move toward you, reward and praise. Use a harness on your Chihuahua. A collar can hurt their little throats. Try not to drag your dog. It could hurt their feet and looks really bad. If all else fails, pick up your Chi and carry them a bit. Then put them back on the ground and see if they get the hint (probably not a good training tip). Booyah, awesome post. I love things like this.